We are a quality airline and a smart alternative to the competition for leisure and business travelers alike. 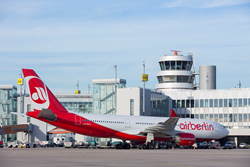 airberlin offers more service this winter from the U.S.
airberlin has announced the addition of ten flights from the U.S. to Berlin and Dusseldorf, its two hubs in Germany starting in November 2016. The new additional frequencies include two more flights from Miami to Berlin bringing the total to four weekly flights, an additional flight to Dusseldorf from New York brings the total to eight weekly flights and one more flight from Chicago to Berlin bringing the total to five weekly flights. In addition airberlin has also increased the service from Ft Myers to Dusseldorf from three to four weekly flights offering travelers the only nonstop service to Germany and beyond from this gateway. airberlin will also resume its year-round service from Los Angeles to Dusseldorf with five weekly flights. New York will be connected with daily services to Germany’s capital city, Berlin providing a convenient choice for travelers. "We are a quality airline and a smart alternative to the competition for leisure and business travelers alike. Our extensive flight schedule and the new connections to North America enable us to strengthen our position as market leaders in Dusseldorf and Berlin. Frequent flyers can use their topbonus miles for upgrades to business class or an XL seat and enjoy our onboard comfort to the fullest," said airberlin Chief Executive Officer Stefan Pichler. by the well-known US consulting firm IdeaWorks Company who came to this conclusion following the evaluation of thousands of booking requests on the websites of 25 frequent flyer programs in March 2016. The results for the travel period from June to October 2015 formed the basis of the evaluation. Other contenders for the award included many of the world’s largest frequent flyer programs. topbonus continues to attract members from all over the world and offers business travelers multiple levels of membership and attractive incentives such as additional baggage, priority boarding and the ease of accruing and redeeming mileage with airberlin and its oneworld® partners. airberlin offers nonstop service to Dusseldorf and/or Berlin from seven U.S. gateways which include Boston, Chicago, Los Angeles, Miami, New York, Ft. Myers and San Francisco and convenient connections to cities all over Europe. airberlin is one of the leading airlines in Europe and flies to 147 destinations worldwide each year. The second largest airline in Germany carried more than 30.2 million passengers in 2015. airberlin offers a global route network through its strategic partnership with Etihad Airways, which has a 29.21 percent share in airberlin, and through membership of the oneworld® airline alliance. topbonus, the frequent flyer programme of airberlin is one of the leading programs in Europe with more than 4 million members. The airline with the award-winning service operates codeshare flights worldwide with 21 airlines. The fleet is among the most modern and eco-efficient in Europe. Together with other airlines, airberlin belongs to Etihad Airways Partners, a new brand with which Etihad has been uniting shared activities since the end of 2014.